QUALITY MATERIAL – thick heavy duty canvas and high quality cow leather, clean stitching and the inner seams are wrapped, a handle for easy carrying. THICK LARGE ZIPPER- A leather pull makes it easy to open and shut the zipper. SIZE- 22.8x10x12.7cm, a great size to store typically used toiletries in an overnight bag. LARGE CAPACITY- can put your facial cleanser, soap, mouthwash and other personal belongings. 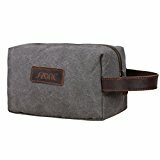 Multi-Functional Bag- it can be used as a toiletry wash bag, travel storage organizer, makeup organizer, cosmetic bag, portable travel kit organizer, household storage pack, shaving kit bag and shaving dopp kit etc.